Two new papers show how rare genetic mutations are helping scientists understand more about the processes that go wrong in the amyotrophic lateral sclerosis/frontotemporal dementia (ALS/FTD) spectrum. A hallmark of these diverse conditions is the abnormal clumping of the nuclear protein TDP-43 in the cytoplasm. In the June 6 Nature Communications, researchers led by David Kang, University of South Florida, Tampa, reported that mutations in the mitochondrial protein CHCHD10 induced TDP-43 translocation from the nucleus to the cytoplasm and poisoned mitochondria and synapses (Woo et al., 2017). In a second paper, Yongchao Ma and colleagues from Northwestern University Feinberg School of Medicine, Chicago, debut a new ALS gene, UBQLN4, identifying a variant in a woman with familial ALS (Ma et al., 2017). Their paper, published May 2 in eLIFE, shows that the D90A substitution in the ubiquilin impairs proteasome function and causes abnormal sprouting and branching of motor axons in model systems. The results further highlight the role of protein homeostasis in neuronal health and disease. “Kang’s intriguing work suggests that wild-type CHCHD10 maintains TDP-43 nuclear localization and protects against TDP-43 toxicity, while disease-related mutations of CHCHD10 have opposite, damaging effects,” said Ronald Klein, Louisiana State University Health in Shreveport. “The work also adds significantly to the importance of mitochondrial function in neurodegenerative diseases,” Klein wrote in an email to Alzforum. The discovery, just over two years ago, of mutations in the mitochondrial protein CHCHD10 (short for coiled-coil-helix-coiled-coil-helix domain containing protein 10) in several families with amyotrophic lateral sclerosis/ frontotemporal dementia (ALS-FTD) suggested for the first time that dysfunction in the organelles, the cells’ power plants, could cause motor neuron disease (see Jun 2014 news and Oct 2014 news). Scientists know little about the function of CHCHD10, which sits inside the mitochondria as part of a protein complex that stabilizes cristae, the organelles’ membrane folds. In patients with ALS-associated CHCHD10 mutations, mitochondria appear disorganized and dysfunctional (Genin et al., 2015). Kang set out to understand how CHCHD10 mutations affect protein function, and whether they also impact TDP-43 accumulation and toxicity. To get at those issues, the researchers first turned to the roundworm Caenorhabditis elegans, whose single CHCHD10 homolog, har-1, includes both the arginine-15 (R15) and serine-59 (S59) residues that are mutated in ALS/FTD. Co-first author Courtney Trotter found that har-1 knockouts developed movement problems similar to those seen in worms overexpressing TDP-43. The animals crawled more slowly on an agar plate, and curled up when dropped in liquid, rather than thrashing about like wild-type worms. Their mitochondria appeared to be in poor health. They produced more superoxide than mitochondria from normal worms. Introducing a human CHCHD10 transgene into the har-1 knockouts completely normalized their behavior—the transgenic worms crawled and swam normally, and their mitochondrial superoxide hovered at control levels. In contrast, human CHCHD10 bearing either the R15L or S59L mutation did not compensate at all, suggesting that the mutations caused a loss of CHCHD10 function. As the two other first authors, Jung-A. Woo and Tian Liu, worked their way through studies on mammalian cells, primary neurons, and finally mouse brains in vivo, they saw the same pattern. Loss of CHCHD10 function, either by knockdown or by overexpression of mutated protein, spelled trouble for mitochondria, disrupting their structure, increasing superoxide production, and causing expression of mitochondrial genes to decrease by half. In primary mouse hippocampal neurons, CHCHD10 mutant expression led to a 50 percent reduction in synaptic markers drebrin and synatophysin as visualized by confocal microscopy. All told, the results suggest the loss of CHCHD10 function in these models poisons mitochondria and zaps synapses. Does any of this affect TDP-43? In the primary neurons, TDP43 exclusively localized to the nucleus, but after knockdown of CHCHD10 or expression of the mutants, a fraction of the TDP-43 moved to the cytoplasm, reaching as far as neuritic processes. Expression of CHCHD10 mutants doubled the cytosol/nuclear ratio of TDP-43 over that seen in wild-type cells. Recent work suggests TDP-43’s toxicity stems from its localization to mitochondria (see Jul 2016, June 2014 news). Indeed, under the influence of CHCHD10 mutants, nearly half of the cytosolic TDP-43 deposited in mitochondria. The CHCHD10 variants also enhanced TDP43 toxicity. Adenovirus-mediated expression of TDP-43 in the brains of young mice caused synaptic markers to drop by 50 and 39 percent in the dentate gyrus and CA3 region of the hippocampus, respectively. Co-expression of CHCHD10 prevented the decline, and expression of either mutant exacerbated it. 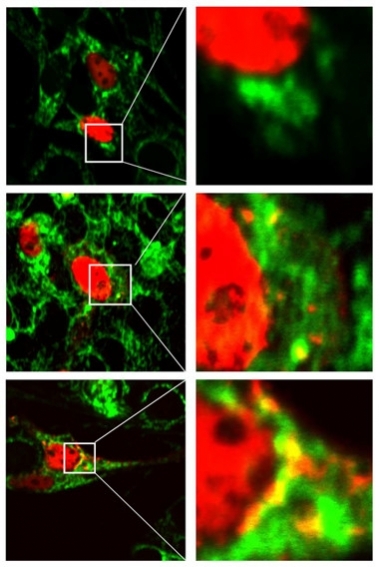 The results establish that CHCHD10 mutations influence toxicity of TDP43 in neurons, however, the researchers have yet to test this in motor neurons or cortical neurons, the cell types affected in ALS or FTD. While the work connects CHCHD10 to TDP-43, many questions remain. How does CHCHD10 influence where TDP-43 localizes, and why do the mutations cause TDP-43 to appear in the cytoplasm? Co-immunoprecipitation hinted that CHCHD10 and TDP-43 physically associate, but that mutations do not disrupt this interaction. “We have to work out the details,” Kang said, noting that their next studies will focus on the mechanisms of CHCHD10 and TDP-43 translocations and their regulation. The second report details how a newly discovered ALS variant in UBQLN4 disrupts a different and equally fundamental homeostatic mechanism—the regulated recycling of proteins via the ubiquitin proteasome system. Ubiquilins deliver proteins to the proteasome. UBQLN1 and UBQLN2 are linked to Alzheimer’s disease and FTD/ALS, but this is the first time UBQLN4 variants have been linked to disease. Ma worked with coauthor Teepu Siddique, whose lab identified the variant through targeted gene sequencing in 267 familial and 411 sporadic ALS cases. One patient carried the single amino acid change, from aspartate to alanine at position 90. None of 332 in-house controls, or more than 60,000 people in a sequencing consortium database, had the change, suggesting it may be the pathogenic variant. To test this, first author Brittany Edens expressed wild-type or D90A UBQLN4 in cultured mouse spinal cord neurons, and found the mutant increased neurite number. In zebrafish embryos, the mutant induced abnormal motor neuron branching as well. These morphological effects accompanied inhibition of the proteasome and upregulation of β-catenin, one of UBQLN4’s target proteins and an important regulator of neuronal development. Treatment with the β-catenin inhibitor quercetin reversed the mutant effects on morphology in neurons and zebrafish. “This is an interesting first report linking UBQLN4 to ALS,” said Lihong Zhan of the University of California, San Francisco, who was not involved with the work. Zhan told Alzforum he’d like to see how the mutation behaves in models more relevant to ALS, such as age-related neuron death. Ma agreed that the models are mainly developmental, but considers them still relevant for ALS, as early life events may render the neurons vulnerable later. The models used in the study were short-term expression systems; Ma told Alzforum they are now working on additional models that will enable a more thorough examination of the mutant’s impact across the lifespan. He hopes that β-catenin, or other substrates of UBQNL4, could become useful therapeutic targets in ALS. Woo JA, Liu T, Trotter C, Fang CC, De Narvaez E, LePochat P, Maslar D, Bukhari A, Zhao X, Deonarine A, Westerheide SD, Kang DE. Loss of function CHCHD10 mutations in cytoplasmic TDP-43 accumulation and synaptic integrity. Nat Commun. 2017 Jun 6;8:15558. PubMed. Edens BM, Yan J, Miller N, Deng HX, Siddique T, Ma YC. A novel ALS-associated variant in UBQLN4 regulates motor axon morphogenesis. Elife. 2017 May 2;6 PubMed. Genin EC, Plutino M, Bannwarth S, Villa E, Cisneros-Barroso E, Roy M, Ortega-Vila B, Fragaki K, Lespinasse F, Pinero-Martos E, Augé G, Moore D, Burté F, Lacas-Gervais S, Kageyama Y, Itoh K, Yu-Wai-Man P, Sesaki H, Ricci JE, Vives-Bauza C, Paquis-Flucklinger V. CHCHD10 mutations promote loss of mitochondrial cristae junctions with impaired mitochondrial genome maintenance and inhibition of apoptosis. EMBO Mol Med. 2015 Dec 14;8(1):58-72. PubMed. Bannwarth S, Ait-El-Mkadem S, Chaussenot A, Genin EC, Lacas-Gervais S, Fragaki K, Berg-Alonso L, Kageyama Y, Serre V, Moore DG, Verschueren A, Rouzier C, Le Ber I, Augé G, Cochaud C, Lespinasse F, N’Guyen K, de Septenville A, Brice A, Yu-Wai-Man P, Sesaki H, Pouget J, Paquis-Flucklinger V. A mitochondrial origin for frontotemporal dementia and amyotrophic lateral sclerosis through CHCHD10 involvement. Brain. 2014 Aug;137(Pt 8):2329-45. Epub 2014 Jun 16 PubMed. Johnson JO, Glynn SM, Gibbs JR, Nalls MA, Sabatelli M, Restagno G, Drory VE, Chiò A, Rogaeva E, Traynor BJ. Mutations in the CHCHD10 gene are a common cause of familial amyotrophic lateral sclerosis. Brain. 2014 Dec;137(Pt 12):e311. Epub 2014 Sep 26 PubMed. Chaussenot A, Le Ber I, Ait-El-Mkadem S, Camuzat A, de Septenville A, Bannwarth S, Genin EC, Serre V, Augé G, French research network on FTD and FTD-ALS, Brice A, Pouget J, Paquis-Flucklinger V. Screening of CHCHD10 in a French cohort confirms the involvement of this gene in frontotemporal dementia with amyotrophic lateral sclerosis patients. Neurobiol Aging. 2014 Dec;35(12):2884.e1-4. Epub 2014 Jul 24 PubMed. Müller K, Andersen PM, Hübers A, Marroquin N, Volk AE, Danzer KM, Meitinger T, Ludolph AC, Strom TM, Weishaupt JH. Two novel mutations in conserved codons indicate that CHCHD10 is a gene associated with motor neuron disease. Brain. 2014 Dec;137(Pt 12):e309. Epub 2014 Aug 11 PubMed. Ajroud-Driss S, Fecto F, Ajroud K, Lalani I, Calvo SE, Mootha VK, Deng HX, Siddique N, Tahmoush AJ, Heiman-Patterson TD, Siddique T. Mutation in the novel nuclear-encoded mitochondrial protein CHCHD10 in a family with autosomal dominant mitochondrial myopathy. Neurogenetics. 2014 Sep 6; PubMed.